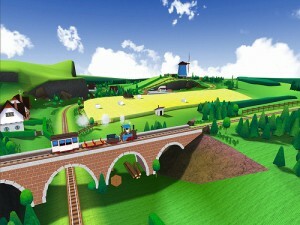 Toca Train takes your Junior Conductor on a virtual train ride! 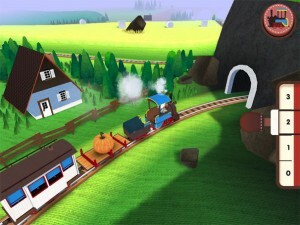 Using the now-recognizable platform to ensure ease of play, Toca Boca has brought the fun to the tracks winding through a digital Scandinavian countryside. This app is just as easy and fun to play with as the other Toca apps and really encompasses a span of ages and skill levels. 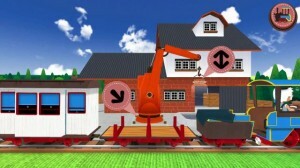 – Players have full control over game play variations – point of view, train speed, etc. We like trains at our house. Not just a little, a lot. My son is 4 years old and obsessed with the more popular lines of animated trains (you can figure out which ones, especially if you have a Trackmaster yourself). So it’s only natural that we play several iPad app games that revolve around locomotion. I swear I saw my son drooling when he figured out that this app had been downloaded. I had to download another Toca app on my iPhone to bribe him into letting me sit down and play Toca Train myself for longer than 17 seconds without interruption. When the app opened, I simply had to hit the play button to begin my journey on the rails with my white-haired conductor at the helm. As my engine chugged through a vaguely Eastern European countryside, I could choose to view the ride from above or tap the train button in the upper right corner of the screen. This moved me to the far more exciting position of seeing things from the conductor’s view, inside the engine itself. There I could move a handle from 0 to 3, with the speed of the train increasing with the numbers. I could also pull a lever to sound the train’s realistic horn. Should I get parched, I merely had to slide my view to the left with my finger, revealing a fresh cup of tea, next to which was a map for any kind of navigation help I should need. My journey would not be complete without stops to pick up either passengers or cargo, which is done simply by tapping arrow buttons. The MO with Toca Boca games is that there is no “right” or “wrong”, so my passengers and my cargo were both optional. It’s not like I lost time or had a point deduction if I sped by that little old lady waiting patiently at the Millvill Station. If you look back at my reviews, you’ll notice that I have grown quite fond of the Toca Boca apps I have reviewed, and I still have some more waiting to be played. The reason for this is that these apps appeal to such a wide group of players – both my 2-year-old and my 4-year-old love these apps for the sheer fact that they almost instantaneously know how to play each game. My youngest actually comes running from the other room when she hears the trademark “Toca Boca!” exclamation when each app opens. 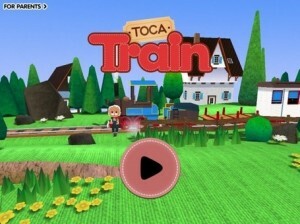 It was a real pleasure for both myself and my kids to stumble upon these games, and Toca Train is no exception; we actually play this game regularly more than any of the other two dozen or so that I have installed. For us it is well worth the download price.